My internet connection is back, just in time for my New Year's round up! Much has been achieved in 2011 and there are a few goals ahead for '12. The running story of 2011 has to be the 'Run-a-Month' journey, that brought myself and brothers Kevin, Cormac and Richie, joined by sister in law Ruth, to all corners of Ireland for 10ks, 8ks, and lastly a half marathon in wonderful Waterford City, and a brand new PB! My stand out races were: the St. Patrick's Day Dublin Run, The Tombrack 4 miler, 10k Chonamara and of course the Cúigéal 8k that I ended up winning! And while I'm on the subject of winning - I also won the Peg Christmas Race for the second year running (a major family event!). I trained well this year, though not half as well as last year... I half stuck to the Furman training programme, but mainly just got out and ran whenever I could. My biking experience in August was the stand-out event of 2011. From a zero biking history I bought a new racer, raised nearly 5k for charity, and cycled across Ireland on my own for most parts. It was an incredibly enjoyable few days - unforgettable. This coming year I'll be training for another marathon - Barcelona in March, and I'm hoping for a time in the 3.30s (3.39 will do fine!). My main concern though is to enjoy my running - and keep on keeping on! 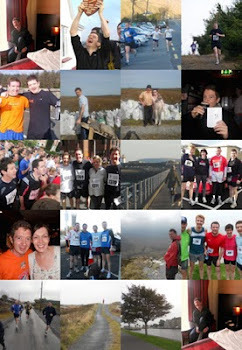 Happy New Year to all the other bloggers and runners - let's keep in touch in 2012! New Year Coming... New Challenge? What Say You All? Before I get on to the meat and drink of this post, let me record tonight's three mile threadmill run. Only three miles, because I hate the threadmill and it's impossible to do much more than this amount on it! And now to the nub of this post: end of year is fast approaching and this will mark the end of the second year of this blog. It's time for a new challenge. A big one. I've been giving this some thought... I love challenges; running marathons, cycling across Ireland etc, and I also have a self-sacrifice streak - punishing myself by cutting out drink, or meat for periods, staying off carbs, chocolates and more! For next year, however, I am looking at something entirely different... My mission: to pay off my mortgage in one year, in order to commit to a life of helping the less fortunate. Can it be done? My mortgage is HUGE. My house is not huge, but my mortgage is. How can I pay this off in a year, I hear you ask? My wife and I are both employed, but our salaries are just average and this Government has cut cut cut cut. So how could I pay off my mortgage that quickly? Well - I'm not sure! But anything I've ever done has started with a wild statement of intent: I'll run a marathon, I'll cycle across Ireland, I'll give up drink for a year... etc. All pale in comparison to this challenge, perhaps... what do you think - am I daft to set this as the year's challenge? I still have another week before I commit to the 2012 challenge, and between now and then I'll discuss other possibilities: giving up meat for a year, running a marathon under 3.30, raising 20k on my charity cycle... and it goes on. But for now, let's ponder: could I clear the mortgage? I picked up Conor at 8.30pm and headed for the bog road of Seanadh Phéistín. I thank the man for introducing me to night running, and furnishing me with the loan of a spare head-torch. This beats the hell out of the treadmill any day (or night!). Last night was particularly cold - two minutes into the run and our hands began to ache with the freeze! We had definitely underestimated the severity of the conditions prior to setting off. With only a mile gone into our run, and heading into some height, when it became clear that the road was far too treacherous to tread. A sheet of fleet was settling into ice and our every step was a wary one. We decided to turn back at the one mile mark and head towards the car again. A pity, but a two mile run is still better than watching the latest episode of Eastenders. Well the weekend came and went and left us all the better for it! The culmination of a year of races for the Run a Month Boys and (Girl) was the wonderful Waterford half marathon. It was a real family affair, as Kevin and Niamh brought the kids, and Richie and Deborah came along to cheer the rest of us on... Kevin, Cormac, Ruth and I lined up at the start on a cold but very crisp and clear Saturday morning. There was a huge turn out for this race - well over a 1500 I reckon. We each arrived in different shape - Kevin hadn't trained for three weeks but had a good year up until now, Cormac has been struggling with injury and Ruth was coming to her first major race after a good half year of training. I felt fine, but not at the peak I had hoped to reach. Still, my tentative aim was a sub 1.50 min run. I settled into this run nice and slowly, and tracked the 1.50 pacers. After a couple of miles I felt good, chatted away to the pacers and decided I would track these guys until the ten mile mark. The course was flat enough until the six mile mark when there was a bit of a drag uphill for a quarter of a mile. This is the second time I've done this half marathon, and the last time out (four years ago) led to a time of 1.59. All went according to plan this time around when I cranked up the pace at mile ten and entered the athletics stadium and finished at a time of 1.48.18. Happy with that! Ruth came in at 2.11 and Kevin and Cormac crossed the line at 2.17. Everyone happy with their achievement, and ready for a drink or two! Saturday is fast approaching, and with it comes the Waterford Half Marathon. The Run a Month Club has held this great event in the highest of esteem since we ran our first race of the year back in Tuam last January. This was to be the pinnacle of our efforts - the climax to our year of races. However, the confidence that should have accrued from a year of races is not really that high right now. I ran five miles on the threadmill yesterday and another four in Salthill this evening, but if truth be told it feels like too little too late. I should have been running ten milers regularly these past few months but I rarely got past the 10k mark and a recent tragic family bereavement left me with a few weeks of little or no running, very late nights and a bit of drinking. The other Run a Month brother has been flat out busy with work and hasn't run in two whole weeks! We'll also be joined by Cormac, who has been injured most of the time! Excuses... excuses! On the bright side Ruth is flying and young Richie is in a constant state of fitness! Máirín is in great shape and Big Ron is too fit! Hopefully my last two sessions will have brought the body back a bit to some semblance of fitness and a bit of more regular rest will see me in a better state come Saturday. Time will tell!